State Systems, Inc. is a proven leader in the analysis, design, installation, and maintenance of a full range of technology-driven systems throughout the Mid-South—including Tennessee, Arkansas, and Mississippi. At State Systems, Inc., we understand the importance of having up-to-date technology and work to stay ahead of this crucial industry curve—passing the added value to our clients. For more information about our technology products, read below then contact us or call 866-308-5701 for a quote. You can trust State Systems, Inc. to implement a structured cabling system with extensive testing to ensure maximum performance when plugging in your network equipment. 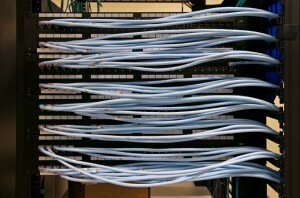 Our technicians can design, install, and inspect the structured cabling system in your Mid-South business. Whether you need a paging or communication system for an educational institution, health care facility, or manufacturing plant—contact us today! Our licensed communication technicians can help design the optimal paging system designed to broadcast to your business with fast, effective, and concise communication. If you’re looking to improve the security of your business or property, State Systems, Inc. has the video surveillance solution to meet your needs. We specialize in the design and installation of custom video surveillance systems for your Tennessee, Arkansas, or Mississippi office or building. Our video surveillance installation technicians can perform a site evaluation in order to determine the type, placement, and number of surveillance cameras necessary to meet your needs. Next, we’ll set up a video surveillance camera system that’s easy to operate and fits into your budget. We can also easily hook up our video surveillance with SS Eye, our hosted video platform for increased accessibility and affordability. SS Eye is State Systems, Inc.’s own hosted video platform that allows Mid-South businesses the access to view live and recorded video monitoring footage 24/7 from the palms of their hands. Accessible with smartphones and computers, this software hosts your video recordings and live video feed off-site. It also allows for cost-effective video monitoring that is accessible remotely, has excellent image quality, and is customizable for your business’s needs. Regardless of your industry or property, digital signage (sometimes referred to as electronic display screens) can help relay your message to your target audience. Whether it is internally focused, office-based, or intended for public environments, State Systems, Inc. can help with all your digital signage solutions—from installation to inspection and repair. Our team utilizes the latest digital signage technology to help you convey your message to your target audience at specific locations and times—ensuring that your message is being seen and absorbed. Whether you need a single voice or data move-add-change (MAC), a complete data center design/build Point-to-Point wireless link, or a complete wireless network assessment for your business in the Mid-South, our staff will work to provide you the right solution maintaining BICSI standards while using the latest products and techniques. For a quote, contact State Systems, Inc. today!